Continuing the trend of making films on exceptional sports personalities, this week’s BUDHIA SINGH BORN TO WIN is not a usual bio-pic for a change, since its not about the achievements, but how an amazingly talented young athlete was not allowed to live his dream raising an important national debate. So as a film, this is an important venture as it rightly serves one of the key purposes of CINEMA by enlightening a big number of unaware citizens of the country about a gifted boy, who has already suffered a lot due to the petty politics played by the visionless bureaucrats of his state and their questionable carelessness. Set in the divine city of Puri in Bhubaneswar (Orissa/Odisha), the film introduces you to a 4 years old kid Budhia, who first gets sold off to a local by his poor helpless mother, but luckily gets rescued by a social worker-judo trainer Biranchi Das (played by Manoj Bajpai), who incidentally notices an exceptional ‘god-gifted running’ talent in him while giving a punishment. As a coach Das begins training the child for big marathon events and then makes him run a 65 km distance between Bhubaneshwar and Puri in about seven hours without water, turning him into ‘The Pride of the State’ and ‘A Talk of the Nation’ overnight. An account of all real life events in Orissa around the year 2006, the film later showcases how the government authorities took an action against the allegedly forced display of talent exploiting the small kid and the Child Welfare Board’s committee also filing a case against his coach Biranchi Das for the same. Heading towards a shocking climax, the film further reveals how it all ended with a suspiciously solved murder and a ban on Budhia’s running which is still continuing till date affecting his rare gifted talent and a possible great career becoming a victim of our sick bureaucracy. Without revealing the exact sequences, assuming that a majority of young viewers are not aware of this unbelievable ‘national star’ of the last decade, I would like to recommend BUDHIA SINGH as a well-made film, which though progresses in a form of docu-drama, yet is not any documentary film at all, remaining true to its subject as required. Written and directed by debutant Soumendra Padhi, the film has been penned and executed with utmost simplicity without bowing down to any unnecessary melodrama or forced nationalism usually found in such films. Despite following a highly realistic approach the narration never slows down even for a while, once it beings talking about the actual marathon event post the initial 20 minutes of a fine build-up. Hence clearing the obvious doubts of a big section of viewers, BUDHIA SINGH doesn’t deserve to be considered and ignored as any realistic art movie unable to engage the viewers. Technically, though the music yet again remains the weakest part, it’s the worth noticing cinematography, a crisp editing and the well-composed background score that constantly keeps enhancing the story progression, especially in the brilliantly conceived marathon sequences and the second half. Looking at it from a different angle, BUDHIA SINGH might be predictable to the viewers who are well aware of the real life story behind this ‘wonder child’ becoming an unfortunate target of our sick system and politics. But for the rest this is sure going to be a shocking eye-opener film revealing the highly sensitive and heartbreaking truth of the debatable struggle faced by an immensely gifted child without any fault of his own. Also as a film BUDHIA SINGH largely works because of its unthinkable concept and incredible performances by Mayur Patole as the kid Budhia, Manoj Bajpai as the coach Biranchi, Shruti Marathe as Biranchi’s wife and the lovable kids in their orphan house/judo school remaining completely natural in their small roles adding a lot to the film’s overall impact. It’s certainly not easy to work with young kids below 7-8 and make them act. However what Soumendra does with Mayur Patole simply takes the film to another level reminding you of two valuable projects namely TAARE ZAMEEN PAR and STANLEY KA DABBA from the past. Mayur plays it so truthfully that you start believing him only to be the real child going through all the troubling attention a decade back. His performance never seems to be forced or taught throughout and that’s exactly where the film scores the most to be honest. Manoj Bajpai is once again remarkable as Biranchi and he truly plays it like a real-life coach especially in the marathon sequence running along the boy inspiring him constantly. Together they both steal the heart of the viewers with an appreciable silent support coming from Shruti Marathe. And the same can also be said about the talented supporting cast including Tillotama Shome as Budhia’s real mother and Chhaya Kadam as the scheming minister. In short, BUDHIA SINGH – BORN TO WIN is one of those powerful, thought provoking films which force you to think that what was actually RIGHT or WRONG in this one unusual case at that particular point of time? And if it was right to stop the deliberate exploitation of an innocent 4 years old kid by his talented but eccentric coach, then who is responsible for ruining his bright sports career putting a decade long - still continuing BAN on the display of his gifted talent? If it was right to stop the boy being forced to try so hard in that tender age then why the authorities didn’t take care of his exceptional talent in the later years, sending him for the much required professional training giving him an opportunity to prove himself yet again? Who stopped them to lift up the ban and let him run in the small events? Who stands responsible for the failure of an athlete who was not even allowed to showcase his skills due to the same old sick bureaucracy and ego-clashes between the political parties. Can this film in any way help the kid now who is around 14 years of age? Can this movie make any difference of any sort whatsoever? Sadly the answer in my personal opinion is NO and the conclusion gets confirmed when I go through a recently published interview/article about the young boy (post the film’s official release) and I am sure after reading the following informative pointers, you will also feel the same with a heavy heart. A. At the age of 4-5, Budhia successfully completed the 65 km marathon between Bhubaneshwar and Puri in a few minutes over seven hours, and got a place in LIMCA BOOK OF WORLD RECORDS as the ‘Youngest Marathon Runner in the World’. 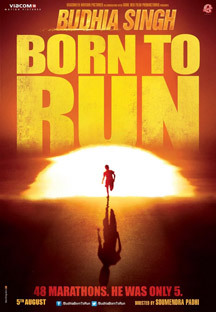 B. HBO and BBC funded a 98 minutes documentary on Budhia titled “MARATHON BOY – Running For His Life” in the year 2011 covering his 5 years of life beginning from 2006. The film also got nominated for EMMY AWARD in the category of “Outstanding Investigative Journalism Feature”. D. Reportedly there was a Gangster angle behind the murder of coach Biranchi Das which has not been showcased in the award winning Hindi film keeping the complete focus on the ‘wonder kid’. E. As per the most recent article in DNA, Budhia accepts that he cannot remember anything from those days of amazing marathons and has spent 10 long years living and getting trained in the sports hostel since then. However due to the still ongoing official ban, he is not allowed to run in even the local marathons. G. Budhia is 14 now but since the authorities think he is still too young to perform in a professional event, the ban is going to be there till he is 18. And therefore the debate continues about what is right and wrong in this specific context? Interestingly, BUDHIA SINGH made me recall another related story of an ignored sportsman PAAN SINGH TOMAR and then I also had in mind the 6-7 years old innocent kids participating in the so called ‘Reality Shows’ on many reputed channels. Perhaps no body there too knows anything about what is right and wrong while interacting with all the kids as per the given scripts. Kids, who might not be even remembering what and which show or who was the judge after 10 years from now…….! No doubt, we are surely fast losing the sense of judging what’s really right and wrong in this constantly changing era led by the clueless media.